Please take a moment to remember the Americans lost on this day, the first day of America's involvement in World War II . . . -S.L. 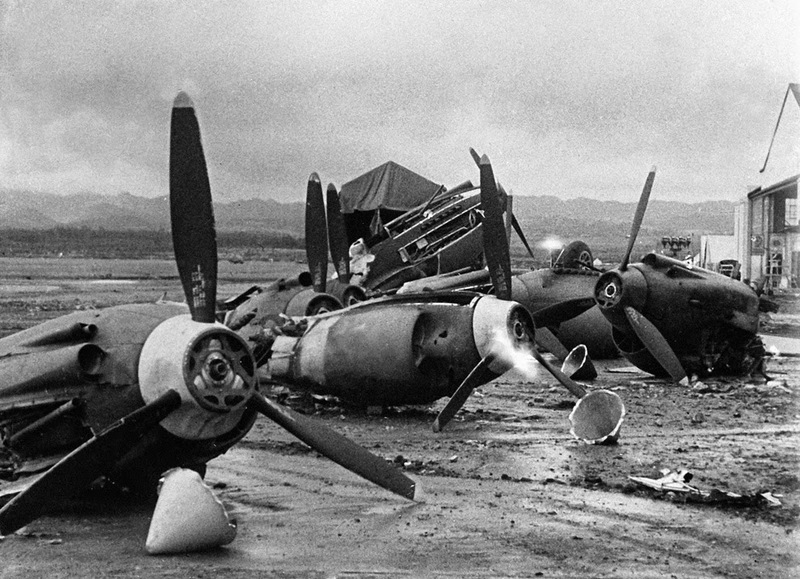 At 7:55 a.m. Hawaii time (12:55 p.m. EST) on December 7, 1941, Japanese fighter planes attacked the U.S. base at Pearl Harbor, Hawaii, launching one of the deadliest attacks in American history. 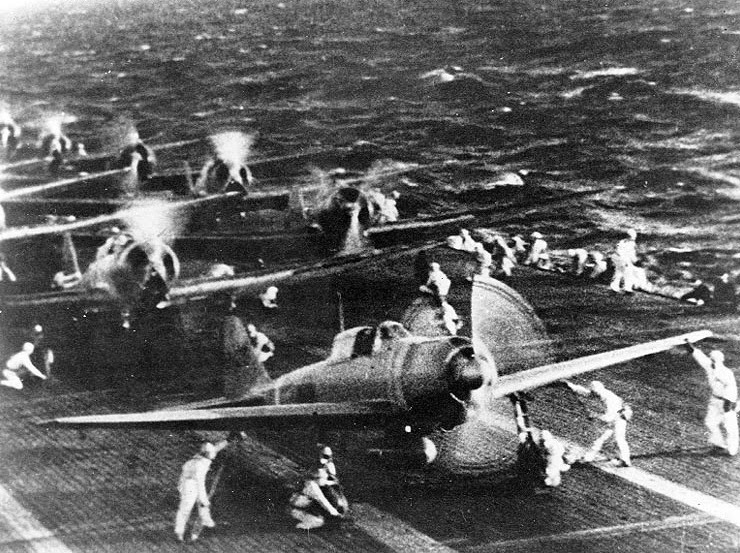 The assault, which lasted less than two hours, claimed 2,403 American lives, 1,178 wounded and damaged or destroyed 18 American ships and nearly 300 airplanes. 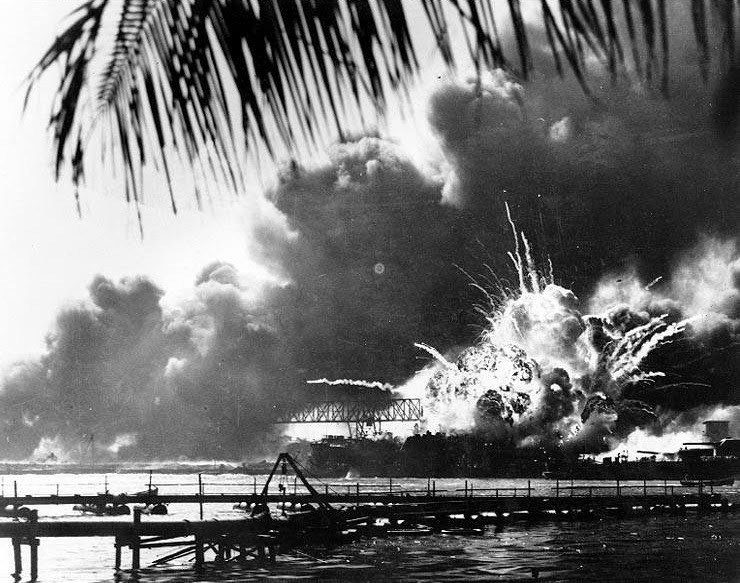 USS Arizona in flames and sinking during the attack on Pearl Harbor, Dec. 7th 1941. 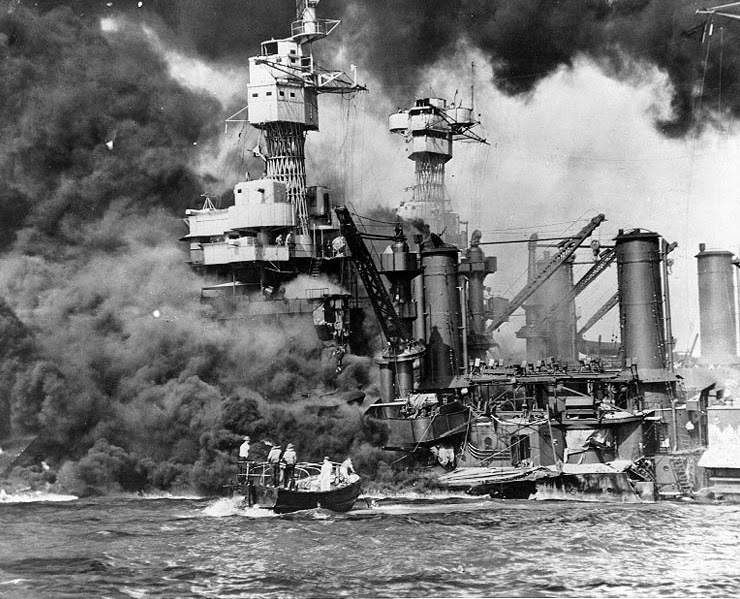 Almost half of the casualties at Pearl Harbor occurred on the naval battleship USS Arizona, which was hit four times by Japanese bombers. Among the 1,177 crewmen killed were all 21 members of the Arizona’s band, known as U.S. Navy Band Unit (NBU) 22. Most of its members were up on deck preparing to play music for the daily flag raising ceremony when the attack began. 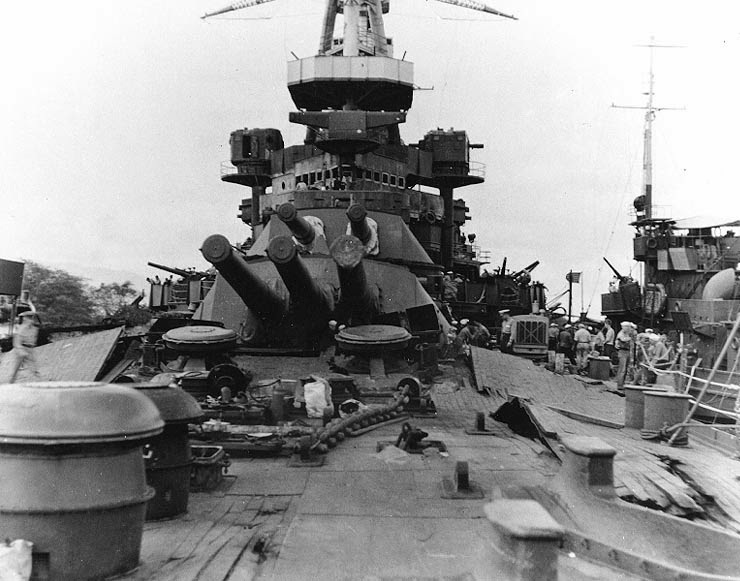 They instantly moved to man their battle positions beneath the ship’s gun turret. At no other time in American history has an entire military band died in action. 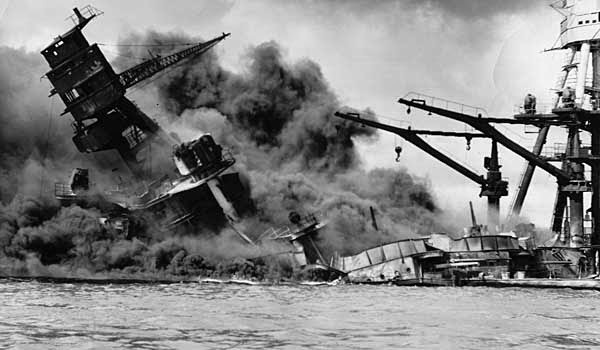 There were 37 confirmed pairs or trios of brothers assigned to the USS Arizona on December 7, 1941. Of these 77 men, 62 were killed, and 23 sets of brothers died. Only one full set of brothers, Kenneth and Russell Warriner, survived the attack; Kenneth was away at flight school in San Diego on that day and Russell was badly wounded but recovered. Both members of the ship’s only father-and-son pair, Thomas Augusta Free and his son William Thomas Free, were killed in action. 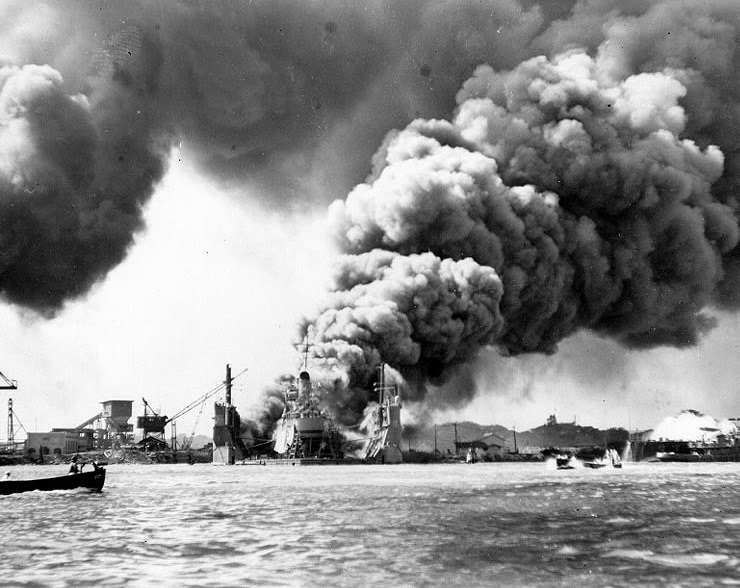 USS Shaw burning in floating drydock YFD-2, during the attack on Pearl Harbor, Dec 7th 1941. 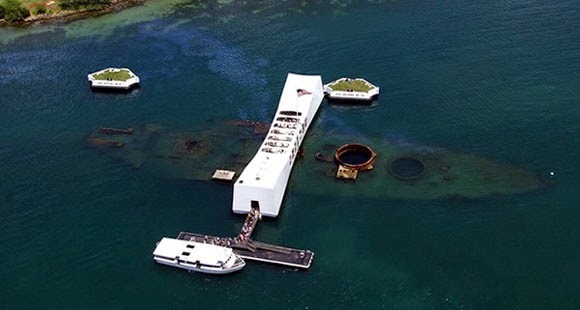 After the USS Arizona sank, its superstructure and main armament were salvaged and reused to support the war effort, leaving its hull, two gun turrets and the remains of more than 1,000 crewmen submerged in less than 40 feet of water. 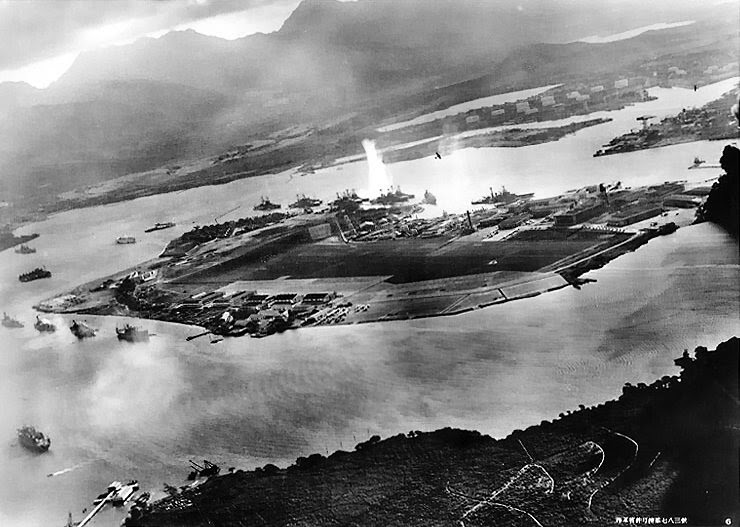 In 1949 the Pacific War Memorial Commission was established to create a permanent tribute to those who had lost their lives in the attack on Pearl Harbor, but it wasn’t until 1958 that President Dwight D. Eisenhower signed legislation to create a national memorial. The funds to build it came from both the public sector and private donors. In March 1961, entertainer Elvis Presley, who had recently finished a two-year stint in the US Army, performed a benefit concert at Pearl Harbor’s Block Arena that raised over $50,000—more than 10 percent of the USS Arizona Memorial’s final cost. The monument was officially dedicated on May 30, 1962, and attracts more than 1 million visitors each year. It may be necessary to remind our children of the events of this day, which seem to have been overshadowed by the 9/11 attacks on the World Trade Center and the Pentagon in 2001. It is incredible to imagine that similar surprise attacks happened to the United States despite a myriad of indicators that should have warned us that an attack was imminent. This is what happens when your enemy perceives weakness, and believes they can move in, wreak havoc and get away with it.